Biomimicry is so smart, its truly a wonder that our human minds have not grasped the idea in everything that we create. By using the intelligent, inspiring, and sustainable designs that naturally occur in our world, designers can mimic this utter brilliance in our own man-made creations. This is biomimicry – mimicking the perfect building blocks of biology in our creations to make our world a more efficient sustainable and beautiful place. The first thing people are eager to learn are the tangible examples. 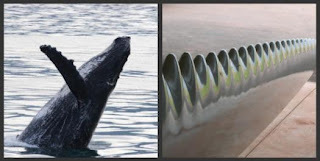 Biomimicry was used to develop everyday items such as velcro (mimics burrs stuck to fabric) and swimsuits (mimics shark skin), famous structures such as the Eiffel Tower (mimics a leg femur) and the Crystal [glass] Palace (mimics a lily pad structure), and machines such as wind turbines (mimics bumps on whale) and airplanes (mimic vultures’ drag/lift actions). As designers, we provide the public with a momentum toward the future. Designers are given the task of inventing the products, buildings, systems of living, communications, materials, and environments that make up our world and point us into the future. Biomimicry allows that future to be sustainable. Using nature as inspiration guarantees that we are using a system that works and preserves life itself. Biomimicry and sustainable design are perfect partners in preservation of the earth and the creatures – including ourselves – that inhabit it. 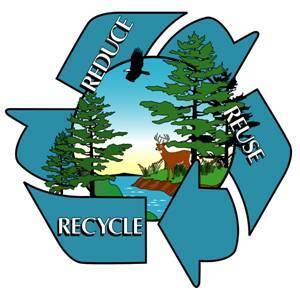 Their partnership includes their parallel foundation of the principles of reducing, reusing, recycling the materials and energy available. The true impulse of nature is ultimately survival, so if designers mimic nature in their creations, they are inherently creating designs that thrive. 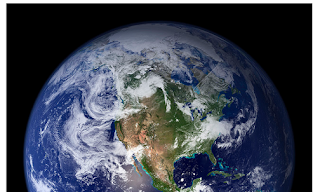 This in turn creates a thriving and surviving earth that is self-sustaining in a perfect cycle of life. 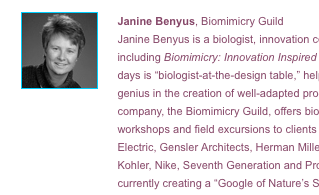 I first heard about biomimicry actually from Janine Benyus — live in person (!) at a lecture she gave at the AIGA Design Conference in Denver, CO to over 2000 graphic, product, and web designers. Her message has always stuck with me in one way or another throughout my graphic design career after that lecture. I am interested in learning more about how animals use their natural surroundings – how they inhabit their home and thrive in it with minimum impact. I believe we can not only learn from the biological build-up of organisms, but also from the way of living that the living creatures have within the natural world. This can help us to see our world in a different way – as a partner in our lives, rather than just a supplier of finite resources. The main biomimicry principle that I use on a daily basis is one based on color, pattern, and aesthetics. 99 percent of my inspiration for visual designs comes from color groupings, patterns, and compositions that I have observed in nature. Because I am a graphic designer, everything I do is visual, rather than structure-based design. Everything I design is also based on communicating a message. I can feel how colors in nature evoke emotion and this guides my design – the blues and tans of the seashore are calming and peaceful; the richness of spring flowers is celebratory and evoking new beginnings. Paper choices, mediums of web and print design, and aesthetic organization of design elements come into play as well. As designers, we have the power to offer the public a new way of thinking – designs that use all of the senses and designs that are created from building up, not from tearing down. The idea of not using pigments for color, but the layering of translucent materials and using light to create a “color”. 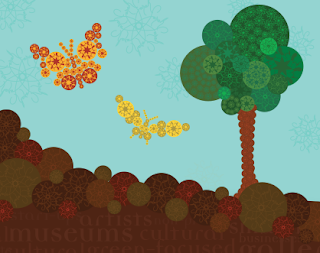 The idea of noticing how communication is executed in nature through sounds, sights, and smells that I might be able to use in my websites and printed materials. We can offer a new way of thinking to modern society that can be one of the greatest gifts offered back to the earth – to help people see the power of nature.